Jim McQuaid's reflections on indie film, writing and how life connects all of these things. I was a sophomore at Cranbrook School when my brother died. He had some form of kidney disease that is probably curable or transplantable today, but was fatal in 1962. He had had difficulties in his journey. First, as a bookworm and budding intellectual, he was a total misfit in the public high school. When my parents sent him to Cranbrook, I think that was a great step forward for him. But he dropped out of Michigan and maybe dropped out of Wayne State (or simply took a few classes). He seemed melancholy, I think, but had started to find his way a bit in 1961. He was the assistant manager of what was then Doubleday Books on Pierce Street in Birmingham. Working in a book store was a perfect occupation for him and I think it seemed like his troubles were behind him when he became ill. I don’t remember much about his illness. Six years older than me, we didn’t have a lot of things in common at that age (he was 21, I was 15). But he was in the hospital for several weeks; six maybe? I was still a boarding student at Cranbrook, so I didn’t visit the hospital regularly. I came on the weekends, I guess. My Mother went every day, making a point to look nice and smile despite what she knew about his condition. For reasons which I was unaware of, I was at home on the morning of February 26th. I had been at home for the weekend; the 26th was a Monday and I guess I thought I was going back to school late that day for some reason. (That would have been very unusual.) Friends of my parents, Grace and Don Sass, came early in the morning and took my sister off on some play date (she was about 3 and 1/2 at the time.) 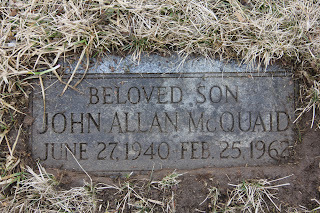 Then my parents told me - we were seated in the living room - that Jack had died the night before. My face turned hotter than I had ever experienced and we sat together and cried. I had never expected to hear that. I don’t remember much about the following days. His funeral was on Wednesday, which was “Headmaster’s Holiday” at Cranbrook - a kind of cabin fever break in the winter. At the funeral, the family sat to the side, somewhat out of sight of the “audience” which included many of his friends from Cranbrook, who were, I think, pall-bearers also. My only concrete memory was my Mother wincing visibly when my Grandmother McQuaid kissed Jack before the coffin was closed. We drove to the cemetery and there was, I guess another piece of ceremony there. I do remember seeing Harry Hoey, the headmaster, looking quite forlorn. Nevertheless, we were able to joke that Jack would have enjoyed ruining the Headmaster’s holiday, as he had no great love for him or the school. That was February 28, 1962. Then I had a wonderful girlfriend, finished Cranbrook, college, graduate school. I taught, l moved around, I had a cat, I got married and had two daughters, moved to North Carolina, had a career in high tech and made some short films. I observed my sixty-sixth birthday. On March 21, 2013, I drove from Cleveland, where I was visiting my elderly Aunt Ethel, to Detroit. I came up Southfield, retracing my Father’s commute from the Ford Motor Company. I crossed the city on Fenkell, past empty stores and trashy neighborhoods. Getting to the better kept neighborhoods of Redford Township, I drove past the site of my old elementary school (a vacant lot) and past the location of a barber shop, now gone, where I cried when they asked how my brother was doing. I toured Dow Road, the street we lived on in 1962, and glimpsed the country club where I swam many summers. I headed up Telegraph Road - a bit gentrified by time, but clearly a highway with a lot of small industrial concerns. Detroit is a factory town. Grand Lawn Cemetery nestles into Telegraph and Grand River, which meet at an angle. I’d spoken to the office before coming and they had a map for me. The greyness of the late winter day and the sights of old familiar places, some cared for, some not, had already created a melancholic pre-disposition, I guess. It took only a few moments to get to “section W” and then to locate “lot 173, grave 3.” There is no headstone, only a simple marker in the ground with the name and life dates. Time had pushed the dirt and grass in from all sides a bit. I began to clear that away to read the entire marker. I got an ice & snow scraper from the car and chipped away at the soil, exposing the whole marker and I shot photographs as I worked. At one point, I made a photograph of the trees behind, thinking that, in an odd way, this has been his view of the world. I also partially cleared off the markers for my maternal grandparents, buried a few graves away. Perhaps it was the sense that there was nothing more I could do. And it has to be also the memory of loss but I simply began to cry and then sob, finally just sitting in my car to cry. I texted my sister, “thinking of you.” She happened to be free at that moment and we exchanged some words. Then I took a photo of the marker with my phone and sent it to her. She was a great comfort in that moment. It is impossible to know what my life would have been like had he lived and impossible not to wonder. Thanks for sharing the story, Jim. Compassionate, honest, deeply-felt. I have an identical twin brother and we talk five times a day and are, obviously, very close. Your story reminds me how different life could have been. Best to you. Mark.